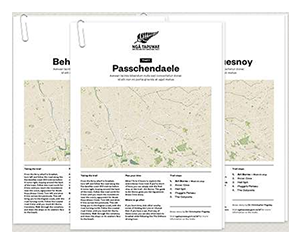 Follow New Zealand soldiers on the Western Front as Ngā Tapuwae guides you through France, Belgium and the United Kingdom. Historical insights, audio stories and interesting articles bring to life New Zealand’s experience on the Western Front. Ngā Tapuwae Western Front is made up of ten trails, five in Belgium, four in France and one in the United Kingdom. Each trail is based around a nearby town. 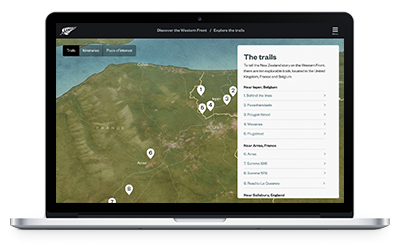 You can follow these trails on the ground or explore them from home. If you are looking to visit the Western Front, check out our travel planning information. If you are looking to visit the Western Front, our travel tips and planning information will help you to have the best trip possible. Will the apps work on my device? The Ngā Tapuwae apps work on iOS devices running 8.0 and higher, and modern Android devices running 4.0 or higher. Will the apps work if I’m not in Europe or Turkey? Yes. The apps are designed to give you a great experience if you are at home or on location in Europe. 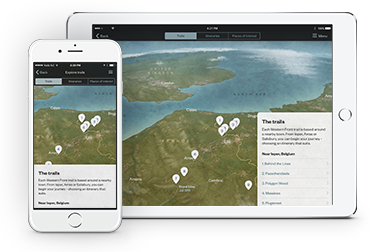 You can listen to all the audio stories and use the maps to see where the action took place. There are also printable guides that you can download and use. Summer, autumn and spring are generally the best times to visit the trails in Europe or Turkey as the weather is often better. You can also visit during winter. More information is in the ‘Plan your trip’ section of the website. It depends on where you’d like to be based. For Europe, each set of trails is based around a town, which are all fairly close to a major city. Salisbury is near London, leper is near Brussels, and Arras is near Paris. In Turkey you can stay in either Eceabat or Çanakkale which are the closest towns to the trails. More information is in the ‘Plan your trip’ section of the website. What should I bring when I’m using the app on location? Sturdy footwear is recommended for walking the trails, wet weather clothing and an umbrella in case it rains, and a pair of headphones to listen to the audio without being disturbed.